As an MBA student in the fall of 2012, I was enrolled in a course titled Design Management & Innovation, which required us to keep a journal of general thoughts and creative observations. I recently stumbled upon it and found this drawing among the entries. 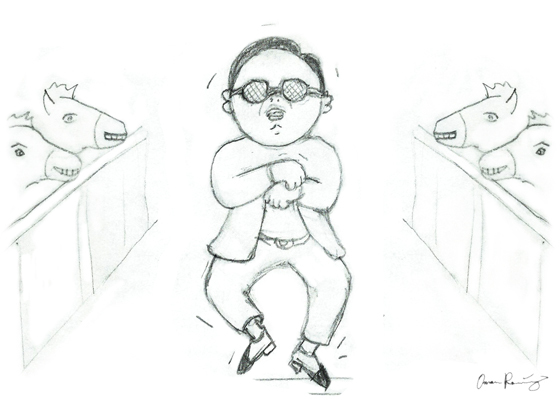 It was accompanied by the note – “How to become an international sensation: Gangnam Style Dance.” The song and its accompanying dance helped catapult its South Korean performer Psy to international stardom, and were peaking in popularity at the time. It was reminiscent of the 90’s Macarena craze (regrettably). My point was really that a dance, and generally, non-verbal cues and visuals, can help transcend language barriers. So if you want to have an international hit, come up with a dance. And a catchy chorus can’t hurt either.